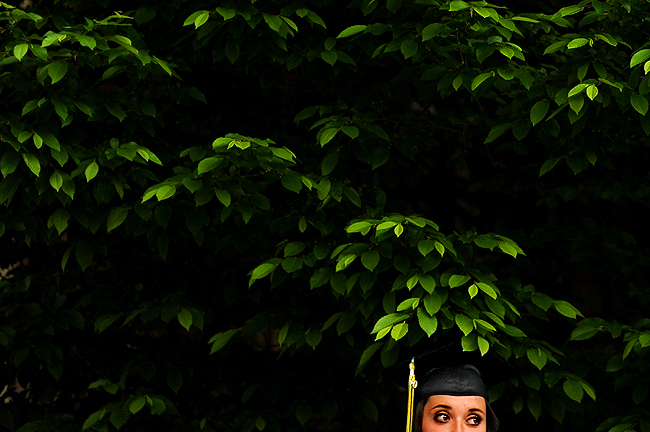 "A student waits outside before the Utah County Academy of Sciences graduation at the Provo Tabernacle, Wednesday, May 26, 2010. "We worked so hard to get here today," Stina Nyhus said. "I'm just glad this day has come, I'm so happy." Utah County Academy of Sciences graduated 102 students total and the guest speaker was Utah Valley University president Matthew Holland." After shooting baseball basically non-stop last month, I shifted my eyes to high school graduations the final week of the May. What can I say? I thought baseball was boring? Graduations are a total snoozefest. By the end of the week I realized I could get the pictures I needed either before or after the actual commencement. The first couple photographed I simply wasted time by sitting there listening to student and guest speakers. Sure, I made some frames and did my best to come up with some fresh during them, but when everyone is motionless, emotionless it's very difficult to make a telling frame. While this frame isn't necessarily "the moment" I liked it as I searched something visual at the Utah County Academy of Sciences graduation at the Provo Tabernacle.